Sister Antonita (Modesta) Soppe, OSF, 104, died on Thursday, January 24, 2019. Modesta Soppe was born in Worthington, Iowa, on March 28, 1914, the third of fifteen children born to Anton and Caroline (Lehmann) Soppe. She started her education at St. Paul’s Catholic School in Worthington, but after third grade her family moved to Dyersville where she attended St. Francis Xavier School. Modesta loved to learn and enjoyed school because she had so many relatives and was related to nearly everyone in school. With so many sisters and brothers younger than she was, Modesta had experience taking care of children. Modesta took care of her youngest sister, Agnetis, for three years before entering Mount St. Francis on September 17, 1933. Agnetis later followed her older sister to the convent. On August 12, 1934, Modesta was received into the Franciscan community and given the name, Sister Mary Antonita. 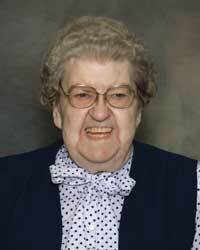 Following her first profession on August 12, 1936, she was sent to teach at Holy Ghost in Dubuque. She returned to Holy Ghost later in her teaching career as well. 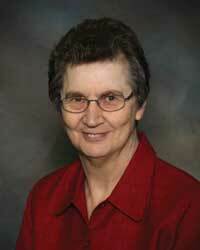 She taught at Sacred Heart in Melrose Park and Corpus Christi in Chicago before going to St. Mary in Danbury, Iowa. Other schools where she taught included St. Mary, Pomeroy, Iowa; St. Anne, Hazel Crest, Illinois; Visitation, Stacyville, Iowa; and Columbus, Waterloo, Iowa. In her later years, she ministered at St. Pius X in Des Moines. Sister retired to Mount St. Francis in 1976. Plants were her passion, and her area in the southeast corner of the old laundry was filled with many of her plants, as well as those of other sisters that she was transplanting or caring for. She had a natural ability to grow plants and took great pride in her work. She was also very proud of being the oldest sister at Mount St. Francis, and would frequently ask lay staff or visitors in the house, “How old do you think I am?” Throughout her retirement, she made weekly trips to her brother Clerus’ home, and often hosted him for meals here. One of Sister’s last goals was to be able to say that she celebrated her 100th birthday at Francis House, but an accident made it expedient for her to move to Clare House in 2013 at the age of 99. Sister is survived by her sister-in-law Rita Soppe; nieces and nephews, and her Franciscan sisters with whom she shared over 84 years of her life. Sister was preceded in death by her parents; her sisters, Leonette (Ambrose) Scheller, Veralda (Chester) Beireis, Monica (Bernard) Ferguson, Melita (Orland) McCarthy, Mercedes (Peter) Berryhill, and Sister Agnetis Soppe, OSF; her brothers Reynold (Albertha), Jerome, Florian (Helen), Alvin, Valerian (Patricia), Eugene, Leon (Betty), and Clerus. Memorials may be given to the Sisters of St. Francis. Your gifts connect you to our ongoing ministries and honor Sisters who are your former teachers, friends or family.